It’s every young player’s dream to don his hometown team’s jersey. When that dream pans out, things don’t always go as planned. The Canucks made that dream come true for two players in the last two seasons. They’ve both had vastly different experiences in a Canucks jersey. Both Troy Stecher and Jake Virtanen had the opportunity to play for the Canucks last year. Virtanen was the “veteran” of the group with 55 games of NHL experience under his belt. Stecher was the standout college free-agent signing who faced an uphill battle if he wanted to play in a Canucks uniform. At the end of the season, the two local boys found themselves in very different positions. Their trajectories look a lot different compared to the beginning of the 2016-17 season. What does the 2017-18 campaign have in store for them? Say that headline 10 times fast. Find that difficult? Try playing first-pairing minutes as an undersized NHL rookie. That’s the position that Stecher found himself in after he was called up to the big club for the seventh game of the season. He didn’t look out-of-place next to Alex Edler on the top pairing and played 22:35 in his first NHL contest. Stecher was able to play on the top pairing right away because his hockey smarts were evident from training camp onwards. He was a better fit up there than Ben Hutton, Erik Gudbranson, Philip Larsen, or any other Canucks defender. That’s both praise to Stecher and a slight at the Canucks’ lackluster lineup. His first few games in Vancouver sent the city into “Stechermania.” The peak of it occurred when he scored his first NHL goal against the Dallas Stars on Nov. 13. His goal tied the game with less than two minutes left before the Canucks went on to win in overtime. Stecher was voted as the Canucks’ best defenceman at season’s end, an outstanding achievement considering that he didn’t make the opening night lineup. He’s diligent defensively and showed some playmaking ability with 24 points in 71 games. While Stecher was voted as the Canucks’ best defenceman, Virtanen could have received an award for most underwhelming Canucks player. Luckily for him, Loui Eriksson snags that honour. There are a plethora of issues that go into the multifaceted story of Virtanen’s season. It all comes as a mild surprise, considering he was decent for the Canucks in 2015-16. Virtanen put up solid possession numbers in a physical, fourth-line role. He followed that up by coming into training camp pushing 230 pounds, and ended up being slower and less effective. After 10 mediocre games with the big club, he was sent to the Utica Comets. Jake Virtanen is poised to spend another season in Utica, and that’s not a bad thing. This B.C. boy ended up about as far away from home as you can get while still playing hockey in North America. With the Utica Comets, Virtanen ended up with 19 points in 65 games for a depleted and offensively-inept club. That drew the ire of Canucks fans everywhere, especially when players drafted after him in 2014 continue to produce at the NHL level. There’s an argument for the Canucks mishandling Virtanen. In hindsight, he never should have played in the NHL during his rookie season. Sure, he held his own, but an extra year in junior usually doesn’t hurt anybody, except perhaps the extremely skilled. He also has the expectations of a top-10 draft pick hanging over his head. Virtanen will likely never live up to that billing, but he can still be an effective NHL player. It’s a hard tag to shake, but fans should be happy if Virtanen can be a physical middle-six contributor to the Canucks’ lineup. First of all, he has to earn his place. 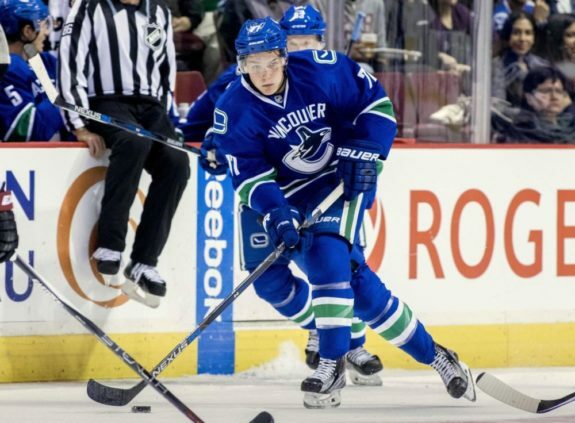 Stecher and Virtanen: Teammates Next Season? Will Stecher endure the sophomore slump next season? That’s the question that everyone will ask after before training camp begins in Vancouver. The second-year blues hit Hutton hard in 2016-17, and it could happen to Stecher. Hutton went from 16 to six points at even strength, despite playing 25 extra minutes. Stecher had 13 points at even strength and he will be hard-pressed to improve on that with a middling Canucks lineup. Stecher does have the hockey IQ to take a step forward in his second year. There are plays he makes in his own end that make observers relinquish all questions about him being one of the Canucks’ best defencemen. His compete level is high and it was clear on many occasions. Here’s Stecher holding Connor McDavid in check during his second NHL game. Virtanen hasn’t kept McDavid in check since his devastating hit on him during the Annual Young Stars Tournament in Penticton back in 2015. It’s going to be an uphill battle for Virtanen to crack the Canucks’ roster next season. After the Canucks’ additions in free agency, Virtanen looks even less likely to crack that opening-day roster. He is lucky that Travis Green will be coaching the Canucks next season. Despite the dreadful point totals, Green did praise Virtanen for working hard and improving his game down in Utica. If he comes into Vancouver and has a stellar training camp, there could be a spot for him on the fourth line. The likeliest scenario is that only Stecher continues to live his dream playing for the Canucks next season. If Virtanen continues to improve down in Utica, then he could join Stecher in the near future. For now, Virtanen is best served to polish his game in upstate New York.